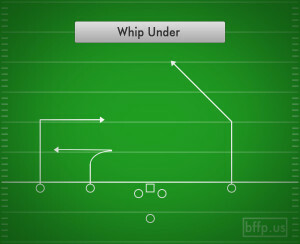 The Whip play is all about misdirection. The hard inside move gets the defense flowing inside, but the quick pivot outside is even more important for a quick move outside. 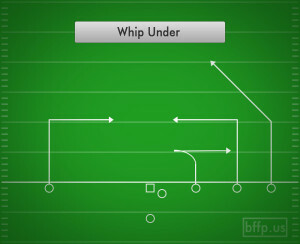 If the inside receiver flowing underneath is covered up, then the outside receiver will be open coming inside over the top. 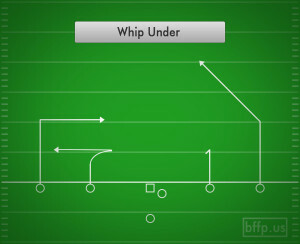 The Whip is best run in the second half of the game after setting up the defense with a sequence of successful slant plays. 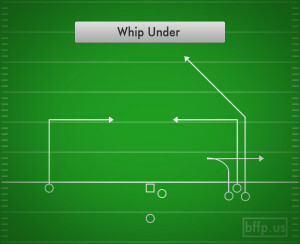 The defender will be ready to jump forward on the slant, but the wide out will plant hard and turn fast outside where he will be wide open running away from the defender.